Installation, wiring and configuration instructions for the 6DR0007T touch screen display. These are the installation and configuration instructions for the Touch-screen SOC display, 6DR0007T. The display comes in a case for table-top placement. Connect the USB connector to the display. You may monitor the display's real time data through the Internet. To set the thresholds, touch the "+" to increase the threshold you want to change, or "-" to decrease it. 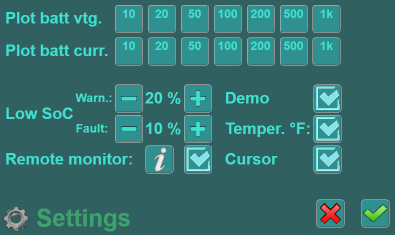 The Demo Mode imitates a BMS to demonstrate the functionality of the display. To toggle the Demo Mode on or off, touch the "Demo" checkbox. 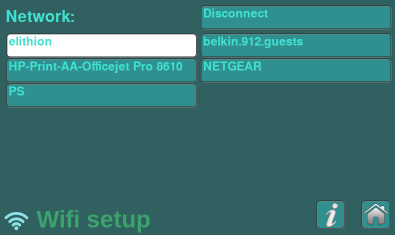 If Remote monitoring is enabled, and the display has Interenet connection, anyone who knows its serial number can view its data in a webpage. .
To toggle enabling remote monitoring, touch the "Remote monitor" checkbox. The main screen can show temperature in °C or °F. To toggle between the two, touch the "Temper. °F" checkbox. Normally you do not want to see the curson in a touchscreen. To toggle visibility of the cursor, touch the "Cursor" checkbox. Internet connection can be through an Ethernet cable or a WiFi network. The Internet connection status is indicated by an icon at the bottom left corner of the main screen. 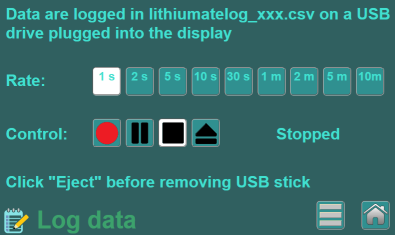 To start a new file, touch the "Record" button again; the new file is named "lithiumatedata_2.csv"
Replace the old background image. Requires a USB keyboard and a mouse. You may want to only show the main screen, by disabling the menus and other screens. WARNING! once you remove the menus, there is no longer a menu to undo this change! © 2008~2019 Elithion™, LLC. All rights reserved, except where noted by CC mark. Page published on Oct 23 2018.